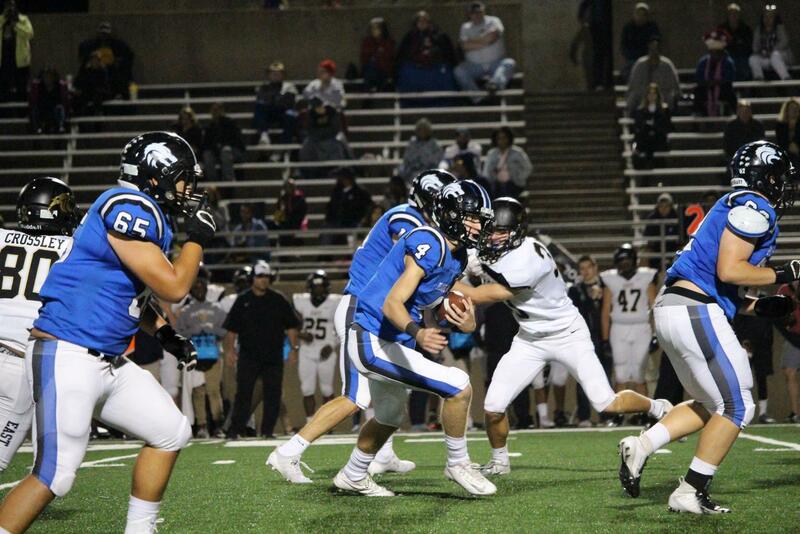 Plano West QB Will Cannon (#4) looks to pick up a few yards on a rush. Cannon threw for 117 yards against Plano East. Plano West was dealt another loss last Friday night against Plano East, losing their homecoming game by a score of 51-17. Plano East opened the scoring by striking on their first drive of the game with a Joseph Carter 3-yard run. Plano West would answer back with a 24-yard field goal from senior Jack Swearingen to make the score 7-3. With 3:28 remaining in the first quarter, Panthers’ QB Brandon Mallory scored on a 2-yard rush. 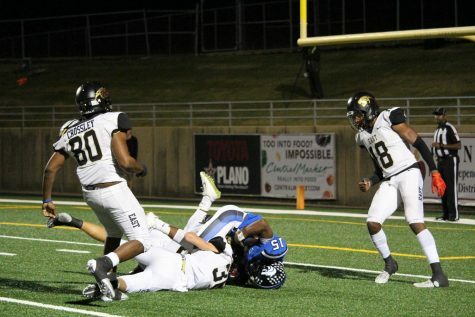 Plano East ended up converting on the two-point conversion following the touchdown with a Mallory pass to Jaelen Anderson to lengthen the score to 15-3. Plano East continued to dominate in the second quarter, with Mallory finding Anderson twice for two passing touchdowns (one from 35 yards, the other from eight) to take a demanding 30-3 lead. Mallory finished the game with 328 yards and five touchdowns (four passing, one rushing). Plano West was able to score their first touchdown of the game thanks to a 21-yard touchdown pass from Will Cannon to Cole Carter with less than a minute to go in the first half. Plano West would not score in the third quarter, with Panthers’ RB Joseph Carter rushing for a 26-yard score with 8:05 left in the 3rd and defensive back Zach Nwachukwu running back an 87-yard interception off a Will Cannon pass for a touchdown to give Plano East a 34 point lead. Nwachukwu, a two-star recruit, has offers from Arkansas Tech, East Central University, and Southwestern Oklahoma State. Cannon ended up rushing for a 3-yard touchdown just four seconds into the final quarter of the game to make the score 44-17. A few minutes later, however, East RB Trey Scott-Jones hauled in a 57-yard touchdown pass to increase the score to 51-17. Plano West running back Noah Scroggins (#15) gets tackled short of the end zone by the Panthers’ defense. Scroggins ran for a career-high 157 yards. Will Cannon finished the game with 117 yards, one passing touchdown, one rushing touchdown, and two interceptions while completing 9 of 23 attempts. Wolves’ RB Noah Scroggins ended the game with a total of 157 rushing yards on 13 carries for an average of 12.08 yards/carry. Cole Carter led Plano West in receiving with 72 yards on three receptions and one touchdown. Nick Griffin followed Carter with 38 yards on three receptions. Panthers’ QB Brandon Mallory finished with 328 yards, four passing touchdowns, one rushing touchdown, and an interception. He completed 17 passes on 25 attempts and had a 68 percent completion rate. Running back Trey Scott-Jones finished with 67 rushing yards and 83 receiving yards as well as one receiving touchdown, while running back Joseph Carter ran for 18 yards and one touchdown. Senior receiver Jaelen Anderson finished with 73 yards and two touchdowns on five receptions. Plano West will play their final game of the 2018 season against Allen (9-0) at Eagle Stadium on Thursday night.